Happy Book Day to me, Happy Book Day to me. Happy Book Day, dear Readers, Happy Book Day to us. Forgive me a little nauseous celebration. It’s the first time I had a bookon sale! 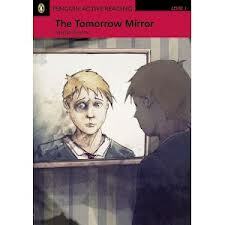 The Tomorrow Mirror is finally, actually available for purchase via Amazon and whatever the usual outlets are for buying Penguin Active Readers. Here’s the link to their website. One day I hope to be able to buy as much as a whole meal from the Royalties but for now I’m just excited to be a published author. I even sometimes refer to myself as a writer these days although I rarely carry it off without some ‘PS I’m not really’ delimitation. Anyway, as promised here is a worksheet of extra ides for using The Tomorrow Mirror in class. It’s aimed at teachers specifically whereas the activities included in the book could mostly be done by students as self study. I hope it’s useful (a couple of the suggestions would be applicable to Graded Readers in general). I also hope it inspires you to use Readers for drama and creative writing as the whole point of reading is for entertainment and to fire the imagination. They’re stories not grammar vehicles and are far more successfully received when treated as such by the teacher. I wish you all the best. Long live readers! Have you gone on out and treated yourself yet? Ha ha! When the royalties cheques go into double figures maybe…sometime next year! congratulation, tht book is great, happy for you wish your all dreams come true.. Thanks! That’s the thing with dreams though – there’s always a bigger one. However, am ahead on dreams coming true…three more books on the way – another one like this with CUP, a Speaking Skills Book with Harper Collins and a novel with Harper Collins new ebook division. This entry was posted on February 21, 2013 by Nicola in Graded Readers, Teaching English and tagged class ideas, EFL, ESL, ideas for class, resources, The Tomorrow Mirror, worksheet.